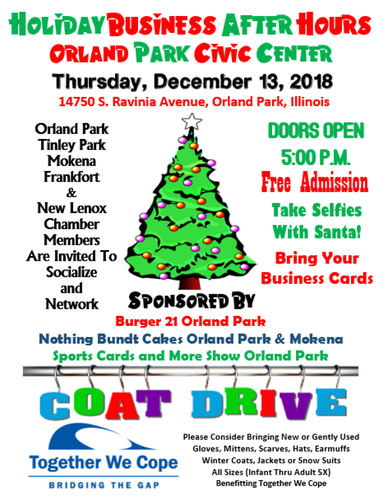 The Orland, Tinley, Mokena, Frankfort, and New Lenox Chamber members are invited to a Holiday Business After Hours at the Orland Park Civic Center. This event is hosted by Nothing Bundt Cakes and Sports Cards and More Show. Admission is free. Highlights include "Selfies with Santa" and a Coat Drive benefiting Together We Cope.